"A favorite recipe from my mother-in-law. Serve over couscous with sour cream." Bring a pot of lightly salted water to a boil. Add leeks; cook until tender, about 5 minutes. Drain; transfer to a plate to cool. Chop leeks finely with a sharp knife, or in a food processor. Combine leeks, ground beef, bread crumbs, and eggs in a large bowl; season with salt and pepper. Mix until combined; shape with hands into walnut-sized meatballs. Heat olive oil in a large skillet over medium heat. Cook meatballs, turning as needed, until evenly browned, 5 to 10 minutes. Add water, lemon juice, and butter; bring to a boil. Simmer, covered, until meatballs are no longer pink in the center, 15 to 20 minutes. 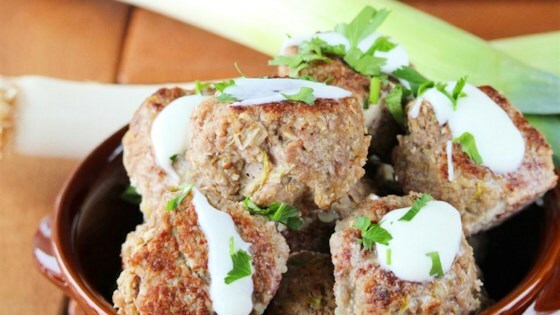 These fun meatballs get their name from the rice that pokes out! Kids love them. This is DELICIOUS! I made a batch last night to have for lunch todaybut they are almost gone a little after breakfast when everyone started "tasting" them. Thanks for sharing this recipe!